HOW DID THE WATERPROOF JACKET EVOLVE ? PART 2 TO DATE (FULL). Part 1 traced the development of the waterproof jacket through to the end of the Second World War. Part 2 takes you through to the present day. Performance problems to be solved by the innovators. Why the UK is prominent in waterproof innovation. The influence of Everest 53: what was used on Everest ‘53, and what ordinary outdoors people used 1950-60’s. The pre-GORE situation in the early 70’s. Bonington’s Expeditions are used as reference points, and the research work of the Everest physiologist Griffith Pugh into fatalities in the outdoors. The GORE ePTFE innovations and revolution in waterproofing…….. GORE-TEX®. How GORE innovation provoked the need for low cost breathables: the little known inside story of the innovation of hydrophilic PU’s. eVENT from the giant GE and the battle of the ePTFE laminates. Out of the box thinking: moisture management, ie wicking or directional. Overview: consumer choice today.To develop this we have added Paramo, Porelle/Sealskins, LA Triplepoint ceramic and eVENT, bringing this unique product biography fully up to date. Innovation is a long term evolutionary process. The trend towards synthetic to polymers occurred when natural fibre fabrics were often used in parallel or combination with non-breathable polymers until the so-called ‘breathables’ arrived. …..BUT emerging technologies are just that, ‘emerging’ and need time for successive generations to yield the improvements, modifications and the ever-crucial cost decreases to appear and perform. The brand leaders at each phase were those who understood and grasped the performance potentials of these materials. …..and so here is the story of that long slow revolution. 2.02 PERFORMANCE PROBLEMS TO BE SOLVED BY THE INNOVATORS. Coated (waterproof) fabrics made from polymers posed three serious technical challenges. The first was to prevent the coating processes from causing a dramatic decrease in the tear strength of the final fabric. The second was to find coating materials and processes which would not delaminate and/or degrade in use, e.g. when challenged by sweat, urine, chemicals and low temperature conditions. The third and final challenge, of course, was to find materials and processes which would release the sweat coming from the garment user, yet at the same time be fully waterproof. No coated or cotton fabrics had succeeded in this. The range of compounds initially available were PVC, neoprene and hypalon (both synthetic rubbers), acrylic and PU – polyurethane. PVC was rather heavy and didn’t work well at low temperatures. Nevertheless Helly Hansen exploited its properties well with fishing and sailing clothing from the 1930’s onwards. Acrylic has never been a performance coating. PU is the longer term winner. Neoprene is heavy, only good maybe for sailing and watersports, and had a very short life in the garments of the 60’s and early 70’s. 2.03 WHY THE UK IS PROMINENT IN WATERPROOF INNOVATION. The UK has been the origin of more waterproof innovations than any other country, partly because of the textile industry and partly because of climate. In Britain, the Lake District and Scotland are legendary for being very wet. Eric Shipton told staff at Outward Bound Eskdale to ‘dress for Lakeland hills as if you are going sailing’. And they did, but of course whilst both sailing and mountain sports need waterproof clothing, walking and climbing generate sweat from energetic motion, quickly chilling the wearer. But rain is only a part of the problem, when accompanied by wind and low temperatures, conditions can get serious. Arguably its easier to deal with -20C than rain and wind at +5C. This is further compounded by the prevailing love of cotton clothing, which ensures the wearer remains cold and wet. Changing garments, fabrics, attitudes and the second battle of the breathables. Cotton was of course used in high performance Burberry, Grenfell and Ventile outer jackets . These were costly and out of the price range of many going into the mountains for leisure after the Second World War. In any case, most people did not use specialist clothing for walking and climbing, in Britain at least. They used cast-off work-wear (which became increasingly more cotton biased or ex-army surplus. 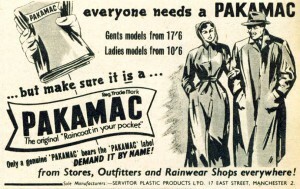 In the 1940s and 1950s in British Army surplus, rubberised capes were popular, to be overtaken in the late 1950s by plastic ‘macs’ aka (by brand name) Pakamacs (made from extruded sheet plastic with welded seams and no fabric at all). 2.04 THE INFLUENCE OF EVEREST ‘53: WHAT WAS USED ON EVEREST ‘53 AND WHAT ORDINARY OUTDOORS PEOPLE USED 1950-60’S, AND THE RESEARCH WORK OF THE EVEREST PHYSIOLOGIST DR GRIFFITH PUGH IN THE 60’S AND 70’S INTO DEATHS IN THE OUTDOORS. Neither Ventile nor Grenfell was chosen for the successful Everest expedition in 1953. A nylon/cotton mix called ‘Wyncol’ was selected by the physiologist Dr Griffith Pugh (see the story of Dr G Pugh in newly published book by Harriet Tuckey, Everest, First Ascent: The Untold Story of Griffith Pugh. In the early 1950s there were few suitable coating compounds for polymers, so a cotton (warp) nylon (weft) fabric allowed traditional cotton dyeing and proofing methods to be used. Later, Ventile went on Bonington’s 1970’s expeditions, alongside modern nylon fabrics. This approach was succeeded in the late 60’s by a polyester/cotton mix, where the polyester was in the centre or core and the cotton spun around the outside. (aka ‘core spun’) Such fabrics were used in rarities like the Karrimor Whillans Box tents from ‘72 -’76, but not on tents generally. The fabric is still much used today in packs and clothing. Everest 1953 had many legacies and the influence of mountaineers pervaded UK society in a remarkable way, a phenomenon which has gradually ceased. One very visible result was the huge growth in outdoor activities based partly around Outward Bound and Duke of Edinburgh (DoE) award activities. This was not all though, because almost every UK education authority in the country set up its own outdoor training centre. With these activities came a series of fatalities during the 60’s and 70’s. Griffith Pugh, with his deep knowledge of sport physiology, researched the causes of these incidents. His findings are a direct influence on what we do and use in the outdoors today. Joe Brown and Don Whillans used plastic Pakamacs to keep dry on the West Face of the Dru in 1964. Pakamacs kept the rain out but also held the sweat in, and consequently quickly became uncomfortable to wear. During this era, outdoor enthusiasts took it for granted that they would at times be rather uncomfortable and scruffiness was something of a badge of honour! ‘Alpinistes at that time, were less concerned with waterproofing but by keeping warm! Powder snow blows away and is dry. 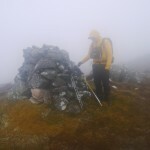 Rain rarely comes into the picture because one cannot set out on an alpine climb in the rain, although getting caught during or on the walk out is another issue. A Pakamac gave us a totally windproof outer layer at a very low cost as long as we had the technique to deal with any internally generated sweat. And thats the nub of it, from my experience as a IFMG guide, personal layering skills have probably declined over the years’. 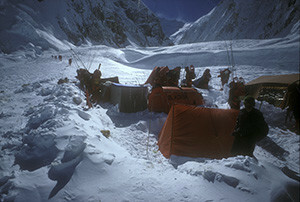 Polyurethane (PU) coated nylon was increasingly used for mountain garments from the 1960s onwards. Like Macintosh in the nineteenth century PU coating was impermeable and a whole new battle to create comfortable (wvp water vapour permeable) breathable garments developed. It was the UK retailers Graham Tiso and Ellis Brigham who , in the mid 1960’s pioneered the Cagoule, ( see Pierre Allain story in part 1) a long, almost knee length garment made in lightweight PU coated nylon, by Peter Storm of Nottingham. During the explosion of outdoor/Outward Bound type activities in the 1960s the visibility of young people on the hills was important. The bright orange Whillans pack was perhaps the colour forerunner and was promptly followed by the few garment brands of the time, who manufactured in bright orange PU or Neoprene coated nylon. Deaths of young people from exposure of young people during the 60’s and 70’s were investigated by the Everest ‘53 physiologist Dr Griffith Pugh. It was on his recommendation that the use of 6’x4’ poly bags as survival bivis became standard practice ( required as standardd in the KIMM/OMM and all 2 day mountain marathons). His findings also underpinned the innovation of the KISU ( Karrimor Instructor Survival Unit) by Ken Ledward at Karrimor. 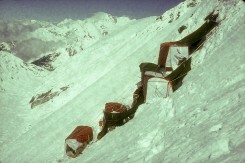 The group shelter eventually became a standard piece of kit for group leaders in the outdoors and ski tours. Peter Storm was set up in the late 50’s and until the early 60’s was making anoraks and ski jackets from double layer poplin. By 1962, founder Noel Bibby pioneered Bri-nylon sailing smocks in lightweight PU coated nylon, dubbed ‘100 series’. This was followed by the 101 cagoule which was promoted initially by retailers Tiso and Brigham. Progress was still still slow into the 70’s. were all well financed. They took many different types of clothing, some were very innovative and therefore unproven, including (as yet unbreathable) coated polymers. One piece suits, first conceived in the the 30’s were made of traditional Ventile and some nylon garments were lined with it ( although the expedition members often cut it out). For polar research work Ventile still compared very favourably with early Gore-Tex® in the early 80’s and is still used today, because it continues to function, even if fuel contaminated. Some manufacturers, Henri Lloyd and G&H amongst them also made garments in neoprene coated nylon. These garments were more suitable for sailing but were, nevertheless, promoted for walking. Even with air vents to reduce condensation this type of garment led to a build-up of condensation. In 1968 one Scottish hill walker, used to wet conditions commented : ‘ I … have a pair of expensive nylon anorak and trousers and quite frankly I never expect them not to become wet inside if I am walking any faster than two miles per hour’. The condensation element has to be taken into account. One way to reduce condensation is to improve ventilation and G and H Products of Batley in Yorkshire, soon to become Craghoppers, produced the Cagjac in 1973 as a partial solution. It was a neoprene coated fabric, ¾ length garment with a full length zip down the front and ‘so combines the protection of the cagoule with the ventilation of the casual jacket. But the real revolution was coming…….. The battle to develop a genuinely breathable outdoor garment gathered pace in the 1970s and into the 1980s with the emergence of Gore-Tex®. PTFE was discovered in 1938 in USA and a French company was the first with the idea for non stick pans, known under the brand ‘Tefal’ in 1954. This ePTFE was then extruded into a film and laminated by adhesives in a micro-dot pattern (to ensure breathability the glue can’t be 100% cover) to the outer fabric. The patent was filed in 1973 and issued in 1976. The first public visibility was in the early winter’s catalogue USA in 1976, and Mountain Equipment and Banton ( now defunct) in the UK for sleeping bag covers in the same year. But it was Berghaus, in the UK, that reaped the rewards for taking on the risks and onerous task of developing the product from its early non-taped versions, using first generation GORE-TEX®. The first generation of GORE-TEX® fabric had a problem with water wicking back through the microporous structure. This was rapidly (but secretly) solved in the late 70’s / early 80s by the application of a microfilm of hydrophilic PU. This information was not publically released until the late 80’s when it was described as adding an “oleophobic” layer. The taping methods used by Mackintosh in the 1880s were entirely manual, but methods were now being developed for use with PU coated clothing. The first attempt byBerghaus was HF welding, but this proved impractical. The new method was to feed the seam of the sewn garment through a machine feeding tape with a hot-air activated adhesive. Here is Gore’s official timeline from their website. 1976 Gore receives its first commercial order for GORE-TEX® fabric — the first breathable, waterproof, and windproof fabric. Second generation GORE-TEX® fabric introduced. 1979 GORE-SEAM® Sealing Machines and GORE-SEAM® tape introduced seam taping machine for GORE-TEX® and other waterproof garments. The adhesive coated tape is activated by the hot air jet and pressed by the roller onto the seams. PORVAIR, a UK company. The original Porvair leathercloths, from the 1960s, were microporous PUs made by the so called ‘lost salts’ process. The present company PIL Membranes still manufacture this type under the name Permair. Their Porelle range does include microporous PU and hydrophilic PU (solid) membranes. They are best known now under the brand of their offshoot, ‘Sealskinz’, who pioneered the use of membranes in socks, followed by full ranges of gloves and hats. The first products, Porelle Drys, were introduced in 1988, followed by a new patented process in 1999. In 2007 there was a management buy-out which resulted in strong growth. Triple Point Ceramic is a micro-porous polyurethane coating combined with specially woven nylon face fabrics. In the manufacturing process multiple coatings are applied to the face fabric. the process leaves no air pockets which can trap moisture. (during the coating process) Cavities of five – 10 µ in size naturally develop in the PU coating. During the manufacturing process, ceramic particles are also introduced into the coating layers creating millions of holes. Polartec NEOSHELL is a submicron fiber membrane. Probably best described as an extremely thin and dense non-woven material, made using extremely fine denier fibres. The result is a microporous structure with a combination of air permeability (hence breathability) and water resistance. It is not as fully waterproof as a continuous membrane. “a hydrophilic polyester that also incorporates poly(ethylene glycol), PEG as the hydrophilic component in the molecular backbone. It is a logical extension of using PEG in polyurethanes.It is unfair to say it is based on our (Baxenden) technologies, as it was probably being worked on independently around the same time. Our development provided coating raw materials that could be applied by many coating companies to many different fabrics and under many different brands. The only way Sympatex could be used was for the inventors to form it into a membrane, then laminate it to a fabric. Sympatex is more akin to GORE-TEX® in that respect. By the end of the 80’s Gore raised their game by introducing a ‘guaranteed to keep you dry’ promotion. This was strongly underpinned by a lot of technical upgrading of the processes and requiring licensees to submit garments to newly developed rain chamber tests. There was initially much muttering amongst licensees but the action resulted in a dramatic upward shift in performance standards, and greater consistency across the brands. In 1982 the first GORE-TEX® was used in boots, a process innovation by Danner Boot, who’s patent was reputedly bought out by Gore.This was closely followed by glove inserts. Moving on into the 90’s, Gore became very dominant in the marketplace, after all they had invented the processes and had done a stunning marketing job. And we all were the drier for it! 2.07 HOW GORE INNOVATION PROVOKED THE NEED FOR LOW COST BREATHABLES; THE LITTLE KNOWN INSIDE STORY OF THE INNOVATION OF HYDROPHILIC PU’S. Lomax goes on to explain further for us about how, why and where ‘hydrophilics’ were invented. Fabric and garment manufacturers bought these hydrophilic coated fabrics and gave them their own trade name. Here are some of the earliest trade names for Baxenden Products given by fabric and or garment manufacturers. Peter Storm tradename was “No Sweat”, Sprayway with “Hydro-Dry”, Craghoppers with “AquaDry”, Carrington Performance Fabrics version was “Cascade”, Coating Applications version was “Exeat”, Cover Plus Coated fabrics was “Vent-X”. 2.08 EVENT FROM THE GIANT GE AND THE BATTLE OF THE EPTFE LAMINATES. By the time Gore’s primary ePTFE patent had expired in 1997, there were of course many lower-cost hydrophilic based coated fabrics available. Gore was always comfortable with its licensees when they positioned these alternatives at a lower cost and lower performance, of course within their range. However, more competition was looming. In 1999 a small USA company named BHA group, using ePTFE for filters branched out into textiles. They modified the processes and instead of sealing the micropores with an oleophobic compound, like Gore, they were able to leave them open, without detrimental waterproofing effect, referring to the fabric as “direct venting”. The fabric was named eVent and the company was shortly acquired for $260m by the industrial giant GE, who had all the financial resources if not the expertise to make the first real challenge to Gore. The initial start up was done in Texas, after having hired ex-Gore people. It then moved on to be manufactured in Asia, as the whole of the textile world off-shored. The business model changed at least another twice in order to try and make themselves a competitive in the marketplace. One of these changes was to allow some leading brands to have their products under their own brand name. One of these was ‘Dry.Q’ by Mountain Hardware, a company owned by Columbia, who had other subsidiaries with other laminates. then began a political battle and they referred Gore to the Federal Trade Commission. This battle is ongoing. the story is told in more detail in Outside Magazine. In parallel with all this work to develop much better waterproof and breathable outer layers, there were others who were thinking ‘outside the box’. Again it happened mainly in the UK. Burberry pioneered innovative design with their patent of 1904. This underpinned a 2 layer fabric garment with lightly waterproofed wool liner and gaberdine outer, to prevent leakage ‘by capillary action’. (see Part 1 for full Burberry story) It was a long time before anything similar was introduced. Japan had the first available denier gradient /directional fabrics from Toray in the early/mid 80’s (the writer used it on some early Karrimor garments) and this fabric is still available today although not easily found in outdoor garments. But these Toray fabrics were not built into a layering system as in UK. Buffalo garments http://www.buffalosystems.co.uk/about/our-story/ was founded by Sheffield based Hamish Hamilton ( famous for his work on Vango tents) in the late 70’s/early 80’s. His first idea was for a sleeping bag for use in wet Scottish conditions. He was very interested in how wicking /capillary action could be used in a positive way to control the users micro-climate and after much searching made his way to the door of a textile company in Padiham Lancs UK called Perseverance Mills. They made fabric for typewriter ribbons, but what fascinated Hamish was the way the fabric worked. After each blow of the typewriter key onto the inked fabric, the ink removed by the key blow (putting the letter on the paper) the ink had to migrate back again along the fibres by wicking, otherwise the letters became too faint. He and Steve Laycock at Perseverance turned this into usable outdoor fabric which, after many modifications, became known as Pertex. Pertex became the outer with an inner of a low cost pile fleece. The next step was clothing and Hamilton opted for a single layer concept that was usable on its own without base layers. This was several years before the launch by Patagonia, in the early 80’s, of their fleece. It was, however, some years after the extensive use of pile fleece in workwear/fishing wear by Helly Hansen, and mountain wear by Javelin and others. Paramo www.paramo.co.uk the clothing brand has its origins in Nikwax which Nick Brown set up in the late 70’s with a waterproofing solution for boots. As the product became successful it made sense to look at clothing. Around 1980 came the ozone depletion scare and there was a need for a product which was, unlike most aerosols, not harmful to the environment. After more success with treatments for clothing it made sense to look at using this technology to produce a range of clothing. However, brands with existing business to lose were reluctant to branch out, so Nick Brown went alone and launched the Paramo brand in 1989. It was the world’s first multi-layer waterproof garment range using wicking/capillary action principles together with denier gradient fabrics ( aka directional fabrics). In part 1 you will see that Burberry patented such a concept in 1904 but never developed it commercially. Consumer choice today is well reviewed in an article by Leeds University Textile Performance Unit published on UKC. What does the future hold? The levels of mvt being achieved by the leading brands do still depend to an extent on the DWR ( durable water repellent ) finishes being applied and these are still only durable and not permanent. The chemicals used, PFC’s , have been the subject of a Greenpeace review and they are building a case for them to be banned. This might well mean more innovation is called for. If and as it happens we hope to review the challenges and progress.